It’s not news that soda is bad for us. But it is jarring to witness the physical effects drinking too much of it has on our waistlines. George Prior, 50, has guinea-pigged his body to do just that. 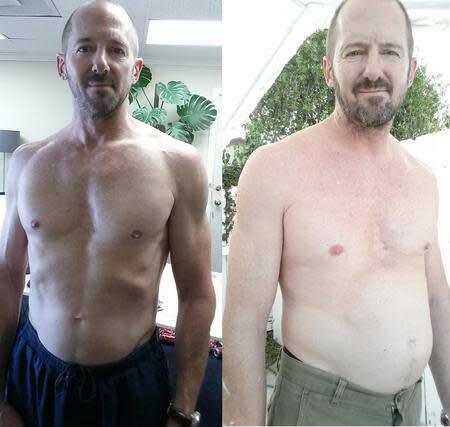 Following in the body-hacking footsteps of Morgan Spurlock — the “Super Size Me” filmmaker who in 2004 ate three McDonald’s meals for 30 days straight — Prior began guzzling down ten 12-ounce cans of Coca Cola daily for one month to see how the whopping dose of added sugar would affect his healthy physique. 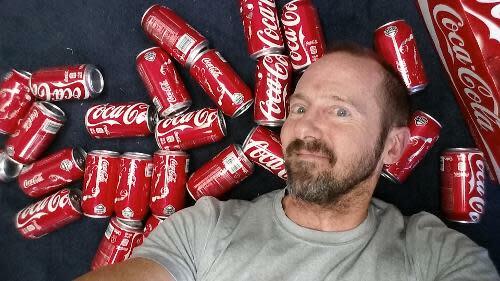 He documented it all on his website, 10 Cokes A Day. The Los Angeleno then began consuming 10 cans of Coke per day. That’s an additional 1,400 calories and 390 grams of sugar per day. By day 15, Prior’s body fat had jumped from 8 to 14 percent. Ten cans of soda seems excessive, but Prior was consuming just twice the amount of added sugar that the average American eats daily. According to the USDA, Americans eat 156 pounds of added sugar every year, which breaks down to 194 grams per day. During his challenge, Prior drank 390 grams of added sugar daily. The Recommended Daily Allowance of sugar for men is 36 grams, and 24 grams for women. Sugar not only makes us pack on pounds, but it also can damage your heart, is linked to cancer, is as toxic to your liver as too much alcohol and can even make your brain age quicker and accelerate memory loss. What did Prior do on Day 31, when the challenge ended? He threw away his unused cans of Coke. “If I have to drink another Coke in 1,000 years it would be one Coke too soon,” he said in the video. But Kirkpatrick cautions that while many of us strive to avoid the “normal” sugary culprits — soda joins a long list with candy, cookies, cake, etc. — we are often duped by secret sugar-packed foods. “Examples include tomato sauce, fat-free dressing, tonic water, marinades, crackers and even bread,” she says. Up next: Our documentary on eating 10 servings of fat-free salad dressing for 30 days. Wish us luck.